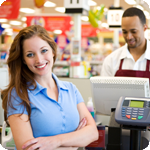 Enhancing the point-of-sale capabilities and reducing the fees for supermarkets, grocery stores, pharmacies, and other food retailers is just the beginning of what we can do for your business. At 1st Advantage Merchant Service New Jersey we have the experience and understanding of the complexity and unique challenges you face on a daily basis. Our extensive range of payment solutions go beyond industry standards. We will help you streamline credit card, debit card, and EBT processing, accept alternate forms of payment and streamline your book keeping procedures. Your industry specalist will also show you new ways to enhance your customers’ shopping experience and understand how your customers are shopping. Additionally, we provide the highest levels of security and technical support that is available 24/7 for you and your staff.